We are nationwide company, which provides services in the range of carrying out innovative systems of photovoltaic installation for over 10 years. Thanks to long-term experience in the industry we design and made the most modern solutions, adjusted to the needs of Customer. We have a wide range of installation materials, devices and full range of advisory, design and maintenance services. 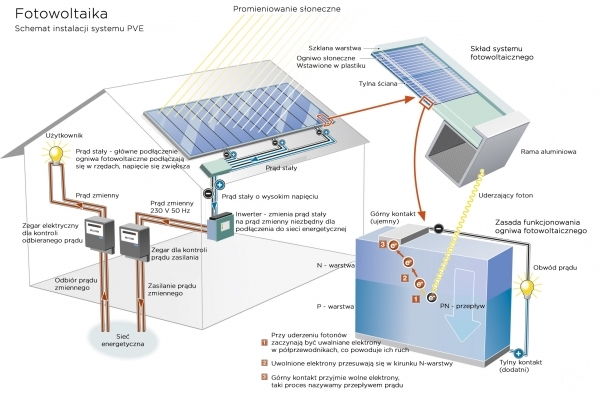 Photovoltaics is a kind of technology, which enables the production of electrical energy from sunlight. It uses incredible potential of solar energy through the process of conversion of sunlight into electrical energy, which occurs in photovoltaic cells. Solar energy belongs to the largest resources of renewable energy, which repeated is possible. In one hour more energy comes from the sun to the earth than all people around the world use in one year. Solar power stations (photovoltaic) are excellent source of clean energy and ecological solution, which allows to limit emission of carbon dioxide. The application of photovoltaic systems also contributes to the reduction of bills for energy. Through hitting photon (sunlight) on the surface of semiconductor of photodiode, the charge will be released and the cell will begin to produce current. The current increases linearly from zero according to the intensity of incident light. The voltage at 200 W/m2 has 83% of maximal value (0.6 V – 1 000 W/m2). ISC – short circuit current, UOC – voltage of open circuit. Current increases with light intensity, voltage from 200 W/m2 increases only marginally to the level of 0.6 V.
Imonocrystal – photovoltaic cell made of one monolithic crystal of silicon. It is characterized by high efficiency – usually 18-22% and high price. It has characteristic dark colour. Polycrystal – photovoltaic cell made of crystallized silicon. It is characterized by efficiency in the range of 14-18% and moderate price. Usually it has characteristic blue colour and clearly visible crystals of silicon. Amorphous – amorphous photovoltaic cell made of amorphous, , formless, uncrystallised silicon. It is characterized by low efficiency in the range of 6-10% and low price. Usually it has characteristic slightly maroon colour and does not have visible crystals of silicon. We invite You to submit questions in the tab “SEND QUESTION”. Our traders will give You all information and will adjust the offer to Your expectations. For the needs of our customers employees of DTS SERVICE are available 24 hours a day and thanks to modern and well-organized logistics we can reach any place all over Poland.